UCSC physicist Tesla Jeltema is among 40 accomplished people under the age of 40 recognized this year by the Silicon Valley/San Jose Business Journal. A special "40 Under 40" feature in the December 7 issue of the Business Journal includes profiles of the honorees, who are recognized for their achievements and the impact they have on their communities. 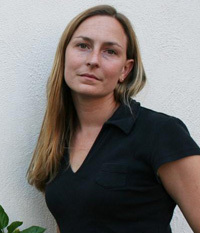 Jeltema came to UC Santa Cruz in 2007 as a Morrison Fellow at UC Observatories and joined the faculty as an assistant professor of physics in 2011. Her research focuses on astronomical probes of dark matter and dark energy, the two great mysteries of modern cosmology. Jeltema is affiliated with two major collaborations in astronomy and astrophysics, the Fermi Gamma-ray Space Telescope and the DEEP2 Galaxy Redshift Survey. She was the first to put constraints on dark matter models via x-ray observations, and she is leading the Fermi collaboration's efforts to discover gamma ray emissions from galaxy clusters. Jeltema is actively committed to promoting the success of women in science and academia. She is involved in an online mentorship program called Women in Technology Sharing Online (WitsOn) that connects college students with prominent women in science, technology, engineering and math. She also started a mentoring program for women in physics at UC Santa Cruz. The "40 Under 40" honorees were celebrated at a reception in Santa Clara on Thursday, December 6.